The primary governance policies and procedures for the entire UW System are listed below. If you have questions regarding governance at a specific UW campus or institution, please contact the campus or institution directly. These rules were promulgated in accordance with the rulemaking authority vested in the Board of Regents by Chapter 36 of the Wisconsin Statutes. The rules govern areas such as the use of university facilities, conduct, and dismissal of personnel. Regent Policy Documents have been adopted pursuant to the policy-making authority vested in the Board by Chapter 36 of the Wisconsin Statutes. The Regent Policies address, but are not limited to academic policies and programs, equal opportunity, tuition and fees, housing, activities of faculty members, student activities, and trust and investment policies. UW System administrative policies and procedures are applicable systemwide and cover academic, financial, and general administration issues. The policies and procedures provide specific direction to UW System institutions and Administrative policies are central to the governance of the UW System. They are issued and approved by the UW System President. 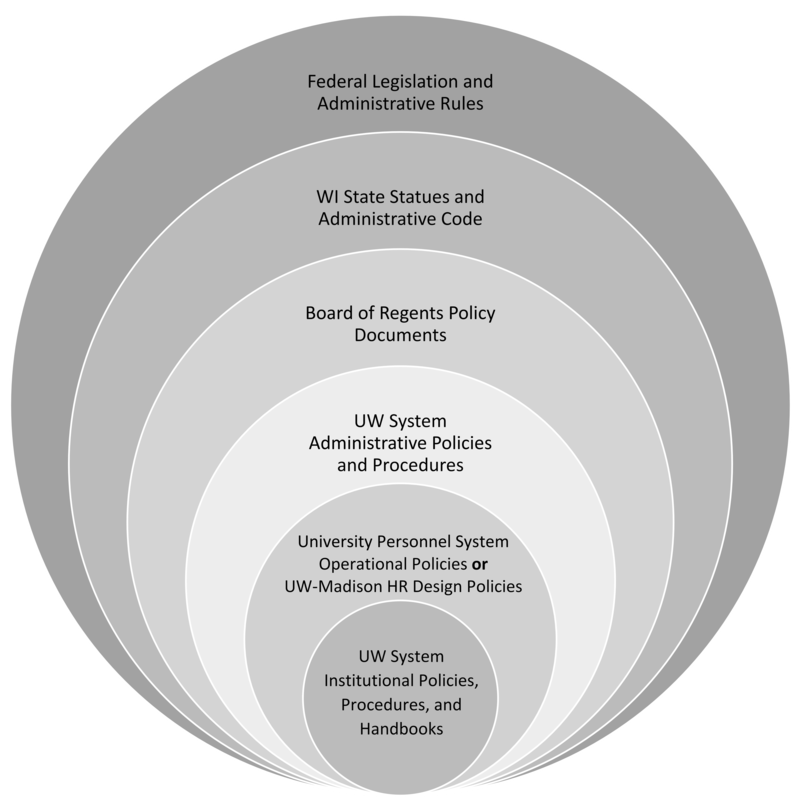 The University Personnel System (UPS) Operational Policies provide the framework for UW institutions, other than UW-Madison, to extend the UW Board of Regents’ authority to university staff. The UW System Institutional Policy Library includes links to policies, procedures, and handbooks for each UW Institution. If you have questions regarding these links, please contact the UW Institution directly. Search Regent Policy Documents, UW System Administrative Policies & Procedures, and University Personnel System Operational Policies. Legal Resources: Resources include links to state and federal laws and regulations, as well as written materials that provide summaries of legal requirements and answers to frequently asked questions on topics such as employee ethics, tenure and appointment, academic staff appointments, open meetings laws, and public records management. Wisconsin Intercollegiate Athletic Conference (WIAC) Handbook: Sets forth the governance of athletics, including WIAC’s constitution, bylaws and administrative regulations.